These DIY Bug Off! 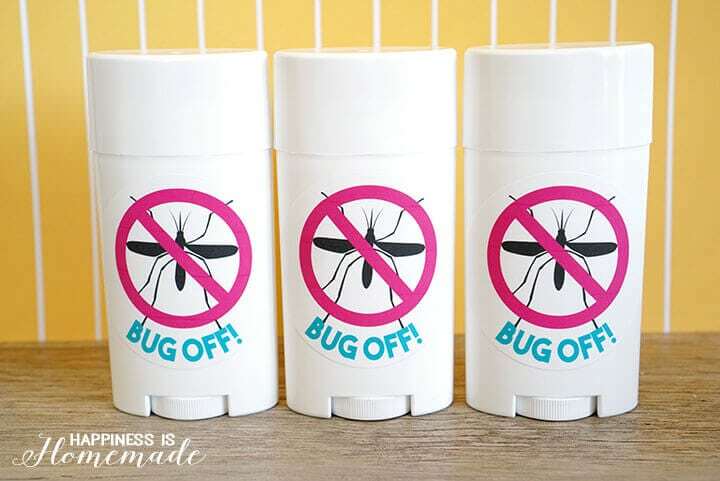 insect repellent sticks use all natural ingredients, and you can whip up a batch to keep your family safe and bite-free in under 15 minutes! It’s that time of year again, and the bugs and mosquitoes seem to be out in full-force already! 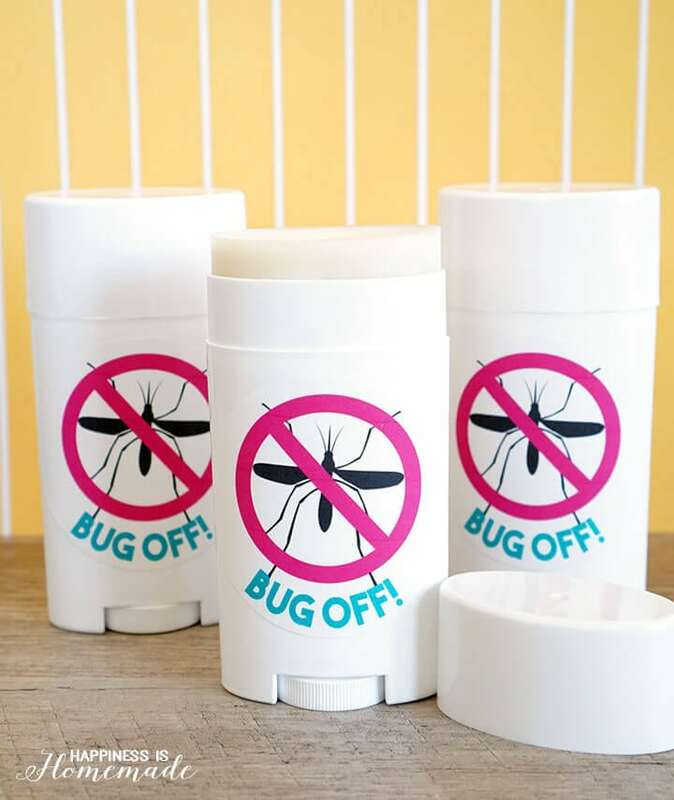 My youngest son is a “mosquito magnet,” and I’ve been searching for a natural bug repellent recipe that would help keep him bite free. 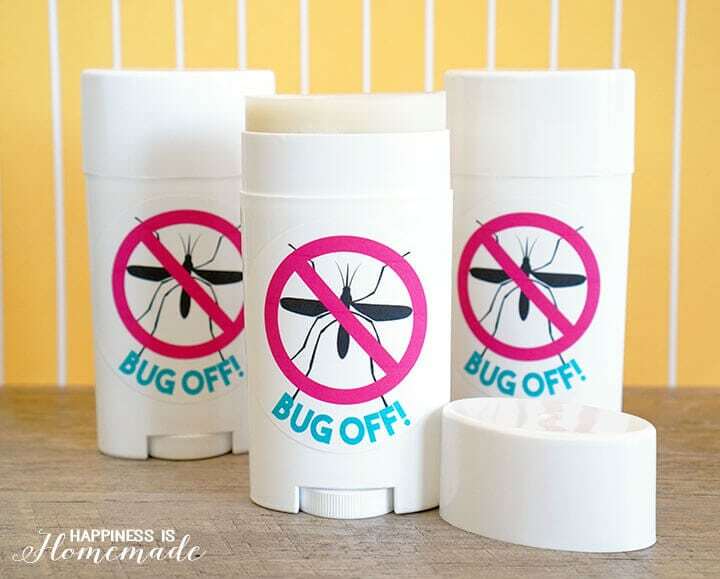 I’ve tried several different combinations, and I’m happy to report that this one is working like a charm – no more painful welted mosquito bites since we’ve started using this! 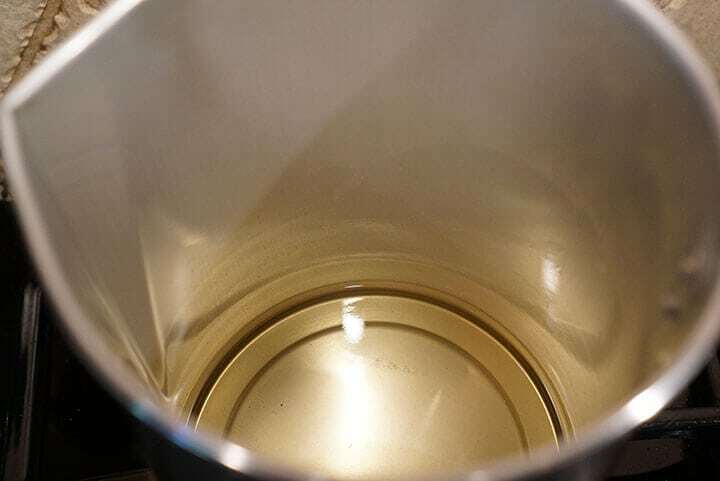 Over the lowest heat setting on your stove top, melt together 2/3 cup coconut oil, 1/2 cup shea butter, and 2/3 cup beeswax pellets in a metal candle making pitcher. These ingredients CAN burn easily, so make sure to keep the heat on LOW, and stir frequently. Turn off the heat as soon as the ingredients are fully melted and combined. Carefully stir in 10 drops of lavender and citronella oil and 5 drops each of lemongrass, lemon, tea tree/melaleuca, peppermint, eucalyptus and Thieves/OnGuard essential oils (alternatively, you could instead use 30-40 drops of Nature Shield Blend which contains many of these same suggested oils). 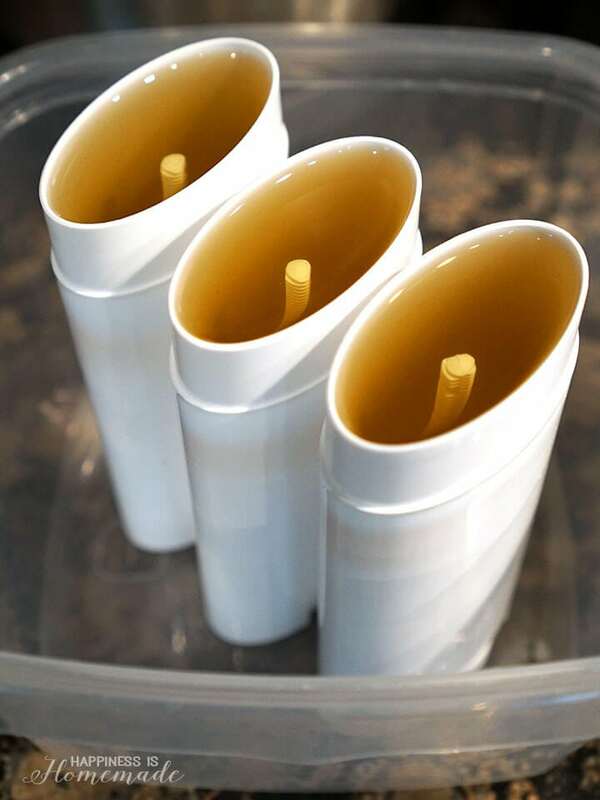 Carefully pour the mixture into empty deodorant tubes (makes approximately 5 tubes), and let sit undisturbed until solid (1-2 hours depending on temperature and humidity). When the sticks are solid and the tubes have cooled, they’re ready to use! 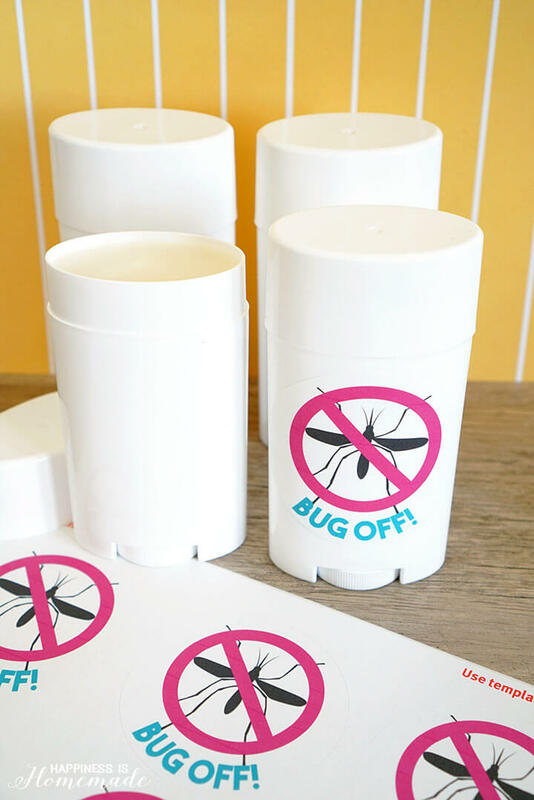 I whipped up some fun “Bug Off!” labels to remind my kiddos what’s inside of the tubes – you can print them out by clicking here for the pdf version or here for the MS Word labels document! To use, simply rub the stick over exposed skin before heading outdoors. The combination of essential oils repels mosquitoes, fruit flies, horse flies, fleas and more! As a bonus, the shea butter and coconut oil are fantastic moisturizers, and the Bug Off! stick leaves your skin feeling smooth and soft! These Bug Off! insect repellent sticks go everywhere with me these days! From the park to the backyard to the baseball field, I love knowing that my family is protected against bug bites using all natural and holistic ingredients! 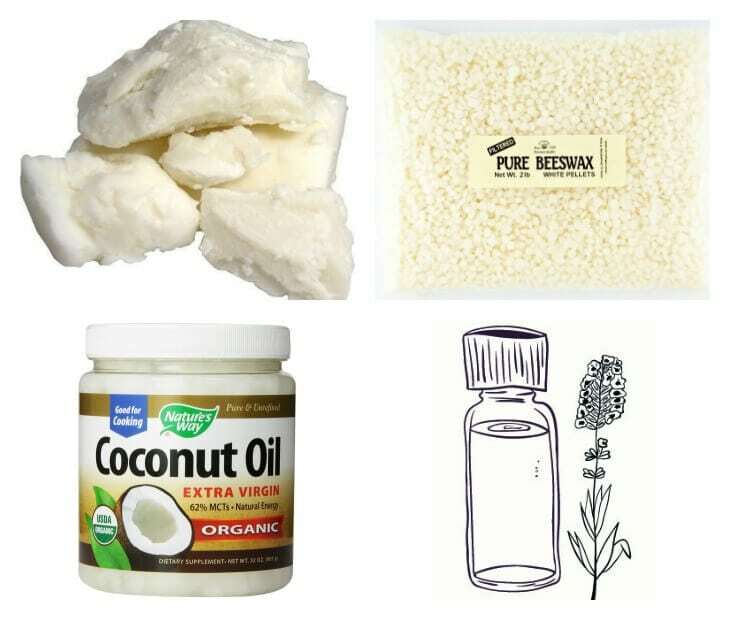 What would you recommend for a substitute for coconut oil? I am allergic to coconut. So if I was not going to make it into a stick could I omit the Shea butter and beeswax add witch hazel and make it a spray? Absolutely! The key ingredients for keeping the bugs away are the essential oils, so you can definitely alter the other ingredients to make a spray! I am excited to try this. I’m wondering about keeping it in the backpack when the temperature is above 80 degrees. Do the repellent bars return to a liquid state with high temps? I have found that though the sticks do soften up a bit in warm weather, they still hold their shape due to the high concentration of shea butter and beeswax in the recipe. We live in the hot central valley of Northern California, and my sons keep them in their baseball bags out at the ball field all the time without any problem! I notice you crossed out the Beeswax in the ingredient list. 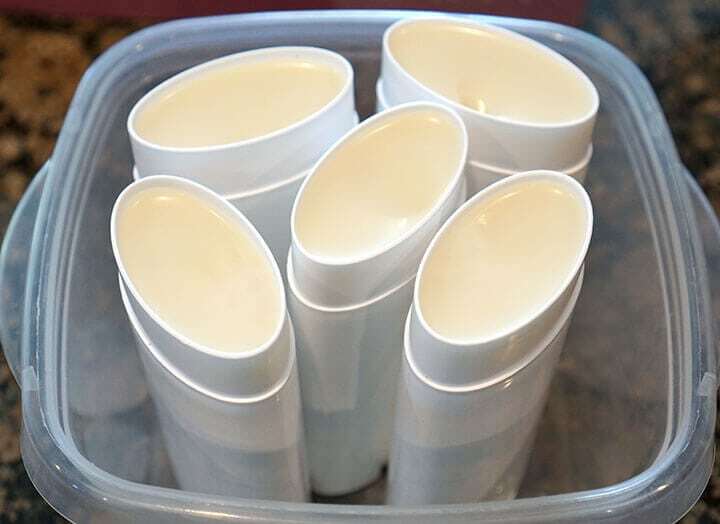 I have just started working with making lip balms using the wax. Why did you cross it off but leave it in the directions? I do not like Citronella at all. I think because it causes stuffiness that I may be allergic to it. Can I make this without the Citronella? Thanks for pointing out that the item had been crossed off. This simply means that the page I was linking it to does not exist any longer. I have updated the link, and the beeswax remains on both the ingredients list as well as the instructions. As for the citronella, it is one of the main effective ingredients in this balm, so I’m not sure that it will work as well without it. Love your recipe! How many hours will one application last before needing to be reapplied? Thanks so much. How many deodorant containerss does this recipe with these measurements make? We are doing a diy birthday party. Thanks!! Absolutely GREAT idea, but who keeps the empty deodorant containers? I sure haven’t and where do you get empty ones….??? Is the 1/2 cup of shea butter in grated/liquid form? Do you you know the measure in oz (weight)? Hi Sabrina, the 1/2 cup is measured before melting (cut into small pieces), so it would be just under 4 oz. Could I add zinx oxide to this to make it into a sunscreen as well? If so, when should I add it? I’m sorry, Sheila, but I don’t have any experience with that, so I can’t speak to it. Is there a substitute for the lavender oil or is it a necessary ingredient in the blend? You can omit the lavender oil if necessary.